What great and noble work uses you up? What great and noble work calls to you, inspires you, focuses your energy, lets your passions meet the world where it needs them most? Our ministry theme for September is vision. As I speak, you are welcome to reflect on your vision for your own life, especially if you’re not sure what that vision is, or if you’ve encountered barriers to realizing your vision, or if you’re in need of a new vision. But I want to focus my words on our collective vision as members and friends of this Unitarian Universalist congregation. What great and noble work uses us up? Our congregation adopted a new vision statement at our annual meeting in May. The statement says the “Unitarian Universalist Society: East will be home to a spiritually alive, richly diverse and growing congregation. We will send forth energy, spirit and strength into our beloved communities. We will love, be present to suffering, comfort, heal, bear witness to oppression, and boldly work toward social and environmental justice.” I hope you encounter in these words hints, suggestions and directions for great and noble work we can do together. I am certainly looking forward to being used up in service to this vision. I hope you are too. Having said that, it feels important to offer the observation that our vision is not really unique among Unitarian Universalist congregations; nor is it unique among liberal congregations of many denominations; nor is it all that different from the visions articulated among many secular organizations, liberal and progressive people in general, and even some pop music and movie stars. Our process for arriving at the specific words in our statement was unique, but the end result fits a pattern. This, by the way, is not a problem. I think it’s a good thing—a sign of our health. This is prophecy. For me, it’s a spiritual song. In total, it offers a vision of a more loving, more inclusive, and more just America. Though there are some subtleties within the song, its vision isn’t subtle at all. It is big, bold, obvious. It also feels very consistent with the vison American Unitarian Universalists and other liberal and progressive people of faith often express for our congregations, our local communities, and our nation: greater love, greater inclusion, greater justice. I subscribe to a blog called “The Velveteen Rabbi.” It features the poetry of Rabbi Rachel Barenblat. She lives in western Massachusetts and leads a congregation in North Adams. Earlier this week she sent out the link to her sermon from worship on Rosh Hashanah morning. The sermon is entitled, “A Vision of Better.” I knew I had to tell you about her sermon when she announced that “Our theme for the High Holy Days is vision.” She preaches her version of the greater-love-greater-inclusion-greater-justice-liberal-religious-vision for the United States of America. She talks about immigrant children being torn apart from their parents at the border; about the insidious Question #3 on the Massachusetts ballot seeking to abolish anti-discrimination protections for transgender people; about looming threats to reproductive freedom and women’s control over their own bodies; about widespread attempts to suppress voting rights; about attacks on press freedoms; about actual Nazis running for Congress. Our sixth Unitarian Universalist principle is itself a very short, very concise articulation of this greater-love-greater-inclusion-greater-justice-liberal-religious vision. It commits us, very simply, to “the goal of world community with peace, liberty and justice for all.” And the vision statement we adopted last May, in my reading of it, fits squarely within this greater-love-greater-inclusion-greater-justice liberal religious vision. We know something about the work of making this vision a reality. Because we collectively hold this vision, we voted to become a sanctuary congregation and have made ourselves ready to welcome guests seeking to avoid deportation. Because we collectively hold this vision, we voted to support the Black Lives Matter movement and have worked in solidarity with Moral Monday CT. Because we collectively hold this vision we fought for marriage equality and anti-discrimination protections for transgender people in years past—and we won. Because we collectively hold this vision, we continually engage in actions for social, political, economic and environmental justice. This has been our version, our interpretation, our reaching toward the greater-love-greater-inclusion-greater-justice-liberal-religious-vision in the United States of America. Even so, with any articulation of a vision—with any sermon, any song or hymn, any poem or prose, and principle or precept, any adopted vision statement—there is always the risk that something will get in the way, as Rabbi Barenblat says. There is always the risk we will feel overwhelmed and slowly retreat from the work. 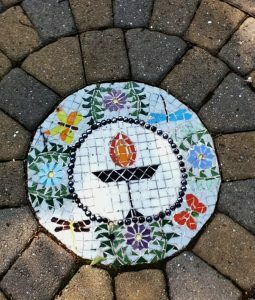 In Unitarian Universalism, where we tend to be hyper-focused on verbal expressions of our spiritual and religious commitments, we encounter the unique risk of confusing the speaking of the visionary words with the actual work of bringing the vision into reality. Just because we’ve said it doesn’t mean we’ve done it. Words may inspire the work, but they aren’t the work itself. Nevertheless, in this moment, words are what I have, so I will use them. I want to make sure our new vision statement does not end up gathering dust in the online equivalent of the proverbial desk drawer. I want it to inform our Unitarian Universalist life together, lest we remain unused. I hope when you encounter the words in our vision statement that say “we will love,” that you will feel, stirring within you, the power to love, to love fiercely, to love across lines of difference, to love yourself, your neighbor, the stranger, the alien, the refugee, the undocumented person, the enemy—and that you will then bring your love to each other and to the world. When you encounter the words in our vision statement that say we will be “present to suffering,” that we will offer comfort and healing, I hope you will feel, alive and flowing within you, the power of your own comforting, healing presence. I hope you can begin to imagine yourself approaching pain—somebody’s pain here, somebody’s pain in our larger community—with a gentle, steady resolve, an unwillingness to turn away, an offer of support, a compassionate touch. Remember healing is not just what medical professionals do. Healing happens whenever we take actions that overcome that fundamental human disconnection Rabbi Barenblat names. Healing happens as we make connections and build relationships, as we acknowledge, accept and live into our interdependence with one another and the whole of life. When you encounter the words in our vision statement that say we will “bear witness to oppression, and boldly work toward social and environmental justice,” I hope you feel rolling and roiling and raging within you the power to confront oppression with clarity and conviction, the power to creatively address our society’s and our world’s most pressing problems, the power to join with others in solidarity, in struggle, in justice movements for the sake of our collective liberation from all the forces that diminish and destroy life. I hope when you encounter the words to our version of the greater-love-greater-inclusion-greater-justice-liberal-religious-vision for the United States of America that you will feel power in you to act, to let the vision use you so that it may, in time, become the new reality. Let’s make our vision real. Let’s not leave this precious life unused. Rilke, Rainer Maria, Barrows, Anita and Macy Joanna, tr., “Alles wird wieder gross sein und gewaltig,” Rilke’s Book of Hours: Love Poems to God (New York: Riverhead Books, 1996) p. 121. Rilke, Rainer Maria, Barrows, Anita and Macy Joanna, tr., “Da neight sich die Stunde und ruhrt mich an,” Rilke’s Book of Hours: Love Poems to God (New York: Riverhead Books, 1996) p. 47. View the video for Janelle Monáe’s song “Americans” from her 2018 album Dirty Computers at https://www.youtube.com/watch?v=POZNheF-KdY. Read the lyrics at https://genius.com/Janelle-monae-americans-lyrics. Barenblat, Rachel, “A Vision of Better.” View the full sermon at https://www.youtube.com/watch?v=ZiMutoPy4Nc&t=915s. Also check out the Velveteen Rabbit at https://velveteenrabbi.com/. Isaiah and Amos, adapted by Zanotti, Barbara, “We’ll Build a Land,” Singing the Living Tradition (Boston: Beacon Press and the UUA, 1993) #121. Wright, Anthony, “We Would Be One,” Singing the Living Tradition (Boston: Beacon Press and the UUA, 1993) #318. Adapted from Thurman, Howard, “I Confess,” Meditations of the Heart, reprinted in Lifting Our Voices (Boston: Unitarian Universalist Association, 2015) #54. We are in the dark season. The sun hangs low in New England’s southern sky, arching quickly along the horizon through the course of each short December day. A few brown leaves still cling to branches on otherwise barren trees. Snow flurries. Storms loom. Lakes and ponds, rivers and streams begin freezing. Wind rattles old windows in dry, dusty homes; heaters rattle and bump as hot air or water flow through old pipes, making eerie yet comforting sounds through long dark nights. There is joy and comfort and solace and peace to be discovered in the dark. I offer these words with great care. So many people either prefer to find their joy in the light, or simply find no joy in this season whatsoever. There are many reasons for this. I want to name three I know are present here this morning. First, Seasonal Affective Disorder—SAD—is real. As the sun grows more distant, as daylight hours grow shorter, many people experience mood changes, anxiety, depression, melancholy, sleep problems and more. There may be a correlation between reduced sunlight and decreased serotonin levels in the body which can impact mood. There may be a correlation between reduced sunlight and increases in melatonin levels which can impact mood and sleep patterns. Six percent of the population experiences acute SAD; another twenty to thirty percent experiences a milder version. Many of you experience it to some degree. So, when I say “joyful is the dark,” you may very well say “no; physically, emotionally, mentally, this dark season hurts. Second, “Blue Christmas.” Not everyone, every year, can enter fully into the joy, merriment and hopefulness of the season. For some the bright lights, festive music, Christmas trees, messages of peace and good will—all of it clashes with their internal state, with recent painful experiences, recent deaths of loved ones, health challenges, difficult childhood memories. We’re dreaming of a white Christmas, and yet for some, everything’s gone blue. There’s nothing merry or happy about it. So when I say, ‘joyful is the dark,” to some it sounds tone-deaf. Finally, there’s the current, wider-world political, social and economic context. Given the outcome of the United States presidential election, many of us hold deep, justifiable fears. In a recent opinion piece in The Guardian, Barbara Kingsolver spoke to these fears. She said “losses are coming at us in these areas: freedom of speech and the press; women’s reproductive rights; affordable healthcare; security for immigrants and Muslims; racial and LGBTQ civil rights; environmental protection; scientific research and education; international cooperation on limiting climate change; international cooperation on anything; any restraints on who may possess firearms; restraint on the upper-class wealth accumulation that’s gutting our middle class; limits on corporate influence over our laws. That’s the opening volley.” Though we don’t know the extent to which these losses will materialize in the coming years, we can reasonably expect efforts to bring them about will be powerful, well-organized, and vicious. If we use the word ‘dark’ in its traditional religious sense meaning dangerous, demonic, evil, then we might say “we live in dark times.” But “joyful is the dark” does not roll off our tongues. Yes, for some the holidays bring complicated emotions, painful memories. We don’t hide them here. We name them in some way every dark season because they are real and we know to ignore them is to ignore part of ourselves. In naming them we honor the fullness of our humanity. Yet that is also the reason I name the joy to be discovered in the dark. That joy, though subtle, is real too, part of our humanity too. Especially in these difficult, bitter days, I believe we diminish a potent spiritual resource, and we diminish ourselves, if we don’t pay attention to the blessings of darkness and the joy residing there. To experience this joy, we must first abandon that traditional western religious equation of darkness and evil. We must abandon rigid, binary thinking where light equals good and dark equals bad. Let us strive, instead, to discern the value in both dark and light, to discern how they complement each other. Let us remember that only those who sit in darkness can witness the light of stars. I find it helpful to recall the ancient Chinese concept of the Tao, the way. Chapter 42 of the Tao Te Ching says, essentially, “the Tao gave birth to the one.” Reality begins with oneness. Then, “The one gave birth to the two,” yin and yang—complementary forces that compose reality. Yin and yang dance in and out of each other; they balance each other. Yang is light, spirit, sky, activity, fire, summer, sun, creativity, heat, the sacred masculine, rationality, reason and intellect. Yin is dark, matter, earth, passive, water, winter, receptive, moon, cold, the sacred feminine, instinct, intuition and feeling. Each of us has all of these qualities within us. In fact, everything has all of these qualities within. Chapter 42 continues: “All things carry yin and embrace yang.” Our spiritual task is not to embrace one aspect of ourselves and shun the other. Our spiritual task is to embrace all aspects of ourselves, allowing them to cycle through our lives in the proper time. In the dark season our task is not to chase away darkness with light, but rather to explore what the darkness has to offer, how it might speak to us, hold us, nurture us and, ultimately, how it complements the returning light. Only those who sit in darkness can witness the light of stars. The early 20th-century German poet, Rainer Maria Rilke, wrote of “the flame / that limits the world / to the circle it illumines / and excludes all the rest.” Light only reveals so much. Beyond that hazy circle of light around the candle flame, beyond the last campfire spark, beyond the cozy corner lamp, beyond the corona around each star, there is a vast background of darkness. Rilke says “the dark embraces everything: / shapes and shadows, creatures and me, / people, nations – just as they are.” Instead of sheltering in the light as protection against darkness, Rilke imagines darkness sheltering, holding, nurturing the light. The dark womb shelters the unborn child. Dark space holds the stars. The dark earth nurtures the seed. What might it mean that the dark embraces us? In more practical terms, there are times when I feel constrained. We all have such times. I sense something in my life needs to change, but I can’t quite figure out what or how to change. Perhaps I want to conduct my ministry differently, relate to my family differently, parent my children differently, structure my days differently. I want to transform patterns and habits that no longer serve me well. But the frenzied pace of life, the relentless rhythm of my days, the fullness of ministry, the fullness of the kids’ schedules—all of it can feel unrelenting, inflexible, constraining. Often when I need it most there is no room for imagining a different way, let alone doing things differently. I feel constrained. Until the dark season comes. This is my experience. When darkness becomes prevalent; when I bring the garbage and recycling to the curb on a late autumn evening for the first time after daylight savings time has ended and the dark surrounds me; when I look up from my work for a moment and lose myself in the dark outside my window; when I leave a meeting to go to my car and the sun has set; I am reliably reminded that this experience of feeling constrained—the experience of not knowing how to make the changes I want to make—happens within the circle the flame illumines. It happens within the light of day. It is the life I know. But it is not the life I don’t know. It is not all there is. The vast darkness reminds me there is vastness in me, and a vastness in you. So much is possible within that vastness. Indeed, in darkness lie all the possibilities my light-of-day mind hasn’t yet imagined. In darkness lie all the different ways of being I cannot fathom when feeling constrained by the life I know. 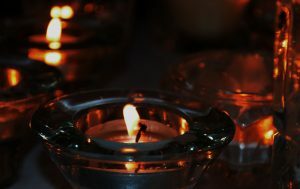 When I sit quietly with the vast dark beyond the circle the flame illumines; when I let the quiet calm surround me; when I let my thoughts go where they will,  (which takes discipline); then I can let my rational mind go, connect back to my instincts, follow my intuition, encounter the divine. This opening up in the darkness is as reliable for me as the feeling of constraint in the light. In darkness, I regain my balance. The ideas begin to flow. My resolve strengthens. We are in the dark season. The sun hangs low in New England’s southern sky, arching quickly along the horizon through the course of each short December day. This may be a season of sadness and melancholy for you, a season in which your body, heart and soul hurt. There may be no relief until the sun returns. But I wonder, might there nevertheless be some blessing—some answer to a long-asked question, some resolution to a long-fought battle, some release of a long-carried burden waiting to reveal itself to you in the darkness? This might be a Blue Christmas for you; there may be no way around hard feelings and memories. But I wonder, might there also be some recollection of a smiling face, good times, caring and companionship waiting for you in the darkness? 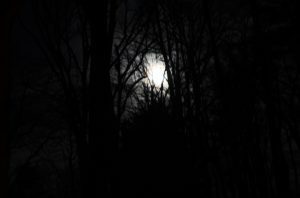 Might the next step toward healing and acceptance be waiting to occur to you in the darkness? Might there be some balm, some salve to soothe you in the long dark night? You might feel fearful, angry, lost, powerless in response to world events. But I wonder, might there be some path forward, some source of courage and strength, some reminder to be gentle with yourself and others, some call you haven’t yet heard, waiting in the darkness to send you forth into the hurting, grieving world? We are in the dark season. I wonder, might these opportunities darkness offers to peer beyond the circle the flame illumines, to let your thoughts go where they will, to ease your frantic mind, to imagine, remember, find strength and courage, come home—might it all be the source of great joy? I pray that it is. Have faith in the night friends. It is half of who you are. Helmore, Thomas, ad., Neale, John Mason, tr., “O Come, O Come Emmanuel” in Singing the Living Tradition (Boston: UUA and Beacon Press, 1993) #225. Kimball, Richard S., “Winds Be Still” in Singing the Living Tradition (Boston: Beacon Press and the UUA, 1993) #83. Kingsolver, Barbara, Animal, Vegetable, Miracle: A Year of Food Life (New York: HarperCollins, 2007) p. 285. Denham, Shelly Jackson, “Dark of Winter” in Singing the Living Tradition (Boston: UUA and Beacon Press, 1993) #55. “Seasonal Depression,” Mental Health America. Visit: http://www.mentalhealthamerica.net/conditions/sad. Kingsolver, Barbara, “Trump Changed Everything. Now Everything Counts,” The Guardian, November 23, 2016. Visit: https://www.theguardian.com/commentisfree/2016/nov/23/trump-changed-everything-now-everything-counts?platform=hootsuite. Apologies: this line is my best recollection of a line from a poem for which I cannot remember the title, author or location. If anyone knows the original line, where it’s from and who wrote it, please let me know!!! There are many translations of the Tao Te Ching. The translation I am quoting here seems to take some poetic liberties when compared to other translations with which I am familiar. But the meaning feels essentially consistent with other translations. I like the words this particular translator uses, especially ‘birth.’ Visit: http://www.taoistic.com/taoteching-laotzu/taoteching-42.htm. Rilke, Rainer Maria, “You, Darkness, Of Whom I am Born,” in Barrows, Anita and Macy, Joanna, tr., Rilke’s Book of Hours: Love Poems to God (New York: Riverhead Books, 1996) p. 57. Did you feel it? I didn’t either. When they pass by a planet or person, gravitational waves squeeze in one direction, and in a perpendicular direction they pull. How often does something more than a billion years old give you a squeeze and a pull? Today, if we learn about alchemy at all, we learn it was spurious, late medieval attempt to turn lead into gold, or to create an elixir to prolong life. It never worked. But this begs a question: if it didn’t work, why was it around for some many hundreds of years? What accounted for its staying power? There was much more to alchemy than these fantastic quests. For my purposes here, it’s enough to know that alchemists did not understand themselves as disembodied observers of the natural world. More to the point, they weren’t observers in the sense that we understand that word today. They were participants. They did not experience a mind-body separation, nor did they experience a separation between themselves and the materials with which they worked. To them, all matter possessed Mind—its own kind of consciousness. Some refer to alchemy as “the search for the God-head in matter.” Everything was alive, and the alchemist was part of it. As they sought to transform matter, they expected themselves to be transformed in the process. Berman says “the alchemist did not confront matter; he permeated it.” Apparently Isaac Newton subscribed to this archaic world-view, and took his role as a steward of the ancient practices quite seriously. Some might call this sense of cosmic homelessness excessively bleak. Others might call it ‘overdone,’ something only philosophers experience. Obviously not every human being feels it. If anything, humans more commonly feel existential terror in response to more immediate concerns: war, migration, the climate crisis, violence, etc. So perhaps cosmic homelessness isn’t such a big deal. However, it is also true that 325 years since Newton published his Principia, many of us are used to the picture of the universe physics paints. To the extent we can grasp it, we’re used to its impersonal vastness. We’re used to our smallness. We’re even used to the conclusion that there is no larger purpose. Of course, many people don’t accept the astronomers’ conclusions and never have. They continue to resist the idea of a meaningless universe. Billions across the planet still take refuge in other-worldly religious visions, still bow down to a commanding, disembodied God, still look forward to a non-physical eternity in Heaven. As such they still help perpetuate the great separations of modernity—the separation of body and mind, and the separation divinity from the earth. These separations are hurting us. We need a new alchemy for our time. I included in our liturgy this morning Rainer Maria Rilke’s poem, “When Something Comes to Me at My Window,” and Heather McHugh’s poem “A Physics,” because, for me, they begin to name an alternative to both cosmic homelessness and anti-scientific blind faith in a disembodied God. They gently sink us into intimate relationship with Nature. They blur the lines between us and Nature. They embrace what the body experiences. And they both start with a reverent shout-out to gravity. “How surely gravity’s law,” says Rilke, “strong as an ocean current, / takes hold of even the smallest thing / and pulls it toward the heart of the world.” McHugh is more veiled. “When you get down to it,” she says. And then the lines between us and Nature blur. “Earth / has our great ranges / of feeling—Rocky, Smoky, Blue— / and a heart that can melt stones. / The still pools fill with sky, / as if aloof, and we have eyes / for all of this—and more, for Earth’s / reminding moon. We too are ruled / by such attractions—spun and swaddled, / rocked and lent a light.” She seems to know something of what the alchemists knew. Rilke challenges the idea of a disembodied existence. “Only we, in our arrogance,” he says, “push out beyond what we each belong to / for some empty freedom.” And McHugh, though not exactly challenging, clearly sees God as somewhere else. “The whole / idea of love was not to fall. And neither was / the whole idea of God. We put him well / above ourselves, because we meant, / in time, to measure up.” But gravity is real, and we do fall. I think McHugh is saying we’ll never measure up, and if anything, we need to measure down, get down to it, let gravity works its magic, pull God off the pedestal, squeeze God out of disembodied existence, out of other-worldly heaven, out of the judgement seat, out of timelessness into this time, into the body of this world, into the energy of this life. Rilke says, “like children, we begin again / to learn from the things, / because they are in God’s heart; they have never left.” This is an alchemical vision for our time. And McHugh says, “We want the suns and moons of silver in ourselves.” This is an alchemical vision for our time. And if this alchemy is still too mired in words, still too abstract, still leaves you wondering, “yes, but how shall I live?” perhaps there’s a lesson in Gary Short’s poem, “Teaching Poetry to 3rd Graders,” in the image of a teacher endlessly kicking playground balls to his students at recess. “The balls rise like planets / and the 3rd graders / circle dizzily beneath the falling sky, / their arms outstretched.” That’s how we ought to live: with joy and outstretched arms, awaiting our playground balls—whatever they may be—as they, like we, are pulled gently towards the heart of the world. There is mighty work ahead. My next two sermons will name what this work is. This reunification of body and mind, of earth and divinity—it is the work of generations. It is work we are doing and must continue to do. And don’t be surprised, if in the midst of this work, you find yourself transformed into something more whole, like an alchemist, such that even your senses work differently, and you awake one fine morning, and you just know—because your body now knows—an ancient wave, rippling its way across the universe has just passed by, has just touched you, has squeezed you and pulled you, softly, as if to say “I know you’re there,” and then continued on its endless way. Greene, Brian, “The Detection of Gravitational Waves Was a Scientific Breakthrough, but What’s Next?” Smithsonian Magazine, April, 2016. See: http://www.smithsonianmag.com/science-nature/detection-gravitational-waves-breakthrough-whats-next-180958511/. Brian Greene Explains the Discovery of Gravitational Waves: https://www.youtube.com/watch?v=s06_jRK939I. In addition to Brian Green’s article in Smithsonian Magazine, see also MacDonald, Fiona, “It’s Official: Gravitational Waves Have Been Detected, Einstein Was Right,” Science Alert, Feb. 11, 2016, http://www.sciencealert.com/live-update-big-gravitational-wave-announcement-is-happening-right-now; and Krauss, Lawrence, “Finding Beauty in the Darkness,” New York Times, Feb. 11th, 2016, http://www.nytimes.com/2016/02/14/opinion/sunday/finding-beauty-in-the-darkness.html?_r=0. Pawelek, Josh, “I Am Lush Land and Rugged Rock,” a sermon preached to the Unitarian Universalist Society: East, March 20, 2016: http://uuse.org/i-am-lush-land-and-rugged-rock/#.VvwLLKQrKhc. Berman, Morris, The Reenchantment of the World (New York City/ Ithica: Bantam Books and Cornell University Press, 1984), p. 107. Quoted in Berman, The Reenchantment of the World, p. 108. C. G. Jung famously explores the depth and breadth of alchemy in his Collected Works, specifically Vol. 12, Psychology and Alchemy, Vol. 13, Alchemical Studies, and Vol. 14, Mysterium Coniunctionis. Berman, The Reenchantment of the World, p. 82. Berman, The Reenchantment of the World, p. 114. Berman, The Reenchantment of the World, p. 115. Primack, Joel and Abrams, Nancy Ellen, The View from the Center of the Universe (New York: Riverhead Books, 2006) pp. 80. Primack and Abrams, Center of the Universe, p. 83. Primack and Abrams, Center of the Universe, pp. 80-81. Primack and Abrams, Center of the Universe, p. 82. Rilke, Rainer Maria, “When Something Comes to Me By My Window,” in Barrows, Anita and Macy Joanna, trs., Rilke’s Book of Hours: Love Poems to God (New York: Riverhead Books, 1999) p. 116. McHugh, Heather, “A Physics,” in Keillor, Garrison, ed., Good Poems (New York: Penguin, 2005) p. 103. Rilke, Book of Hours, p. 116. McHugh, Good Poems, p. 103. Rilke, Book of Hours, p. 116-117. Short, Gary, “Teaching Poetry to 3rd Graders.” See: http://writersalmanac.publicradio.org/index.php?date=2009/03/29. The early 20th century German language poet, Rainer Maria Rilke, writes: “A fracture broke across the rings you’d ripened. / A screaming shattered the voices / that had just come together to speak you, to make of you a bridge / over the chasm of everything. / And what they have stammered ever since / are fragments / of your ancient name. This is certainly not a holiday poem. It’s not particularly seasonal or even Decemberish. It speaks to me about brokenness in the human family, brokenness in the collective human spirit, and even brokenness in God. I offer this poem to you this morning because the midwinter season—this season of the solstice, of the returning sun, of festivals of light, of Advent, of stories of miracles and messiahs, angels and the births of kings; this season of hope and expectation, of promises of peace on earth and good will to all, of shopping and gift-giving, Yule logs, sleigh rides, Santa and mistletoe—the midwinter season, at its best, calls us to encounter ourselves differently, to live differently, to heal the brokenness in the human family, to heal the brokenness in the human spirit, to heal even the brokenness in God. The midwinter season, at its best, calls us away from the fractured rings, away from the chasm of everything, away from fragmentation; it beckons us on towards a deeper meaning for our lives; it beckons us on toward wholeness. We can’t—or don’t—always follow, but it beckons nevertheless. I want to share some reflections on my childhood to illustrate what I mean by brokenness in the human family, the collective human spirit, and even in God. This sharing may sound familiar to some. I’m revisiting pieces of a sermon I wrote in seminary and then preached several times in the early years of my ministry, including on March 16th, 2003, the very first time I preached for this congregation. So I didn’t worry. I trusted science. I still do. Growing up with a father who was and is a driven and passionate scientist who has spent his career unraveling the mystery of metastasis, I have learned to trust in science. Being the father of a child who underwent three successful open heart surgeries before the age of three and now lives a normal life and ran a mile in under ten minutes in the middle of October, I am one who trusts in human beings and human progress. This trust is central to what I mean when I call myself a person of faith. In 2009 my mother’s mother died at age 102 in Hanover, PA. The modern life we are accustomed to, especially here in the United States, was not her life. My faith in science and human progress was not her faith. She and my grandfather were born on farms in rural Pennsylvania Dutch country. She remembered traveling into town by horse and buggy. She remembered walking three-and-a-half miles to St. Bartholomew’s on Sunday mornings where they practiced a modest, agrarian, pietistic Christian faith. I see them now as People of the Earth. They knew the Earth. They knew how to bring forth a yearly bounty from the Earth and its creatures. They knew and respected Nature’s power. They knew hardship and struggle, especially with the advent of the Great Depression. They knew how to adapt to changing circumstances, how to transform hardship into opportunity. They knew something of human limitations, frailties and death. In my view the Earth imparted this knowledge to them, though I’m almost certain they would not name the Earth as their teacher in quite this way. They would be more likely to proclaim that their faith in Jesus Christ carried them through hardship, helped them overcome limitations, and actually saved them from the Earth’s whims and fury. As a child growing up in a science-oriented, suburban New England household, practicing a rational, Humanistic and often anti-Theistic Unitarian Universalist faith, it was sometimes spiritually disconcerting to visit Hanover. It was in Hanover that I first became aware of people who believed my family and I were destined for eternal punishment because of our rational religion and our rejection of the miracles and the divinity of Jesus. (No one in my mother’s family ever said this, but I heard it at St. Bartholomew’s from time to time.) It was in Hanover that I first recognized my own capacity to judge others harshly when their faith seemed old-fashioned, unexamined and even childlike. And yet God was alive and palpable in Hanover. I listened intently as my grandmother spoke of God’s love. I longed for that love in my life. She spoke of God’s anger too, and hell. I worried about that. I said my prayers at bedtime just in case: Now I lay me down to sleep…. Hanover could be so spiritually disconcerting. I longed for God’s love even as my modern Unitarian Universalist self was intentionally growing distant from God, from the old, unquestioning faith and the old, irrational church that espoused it. Hanover was disconcerting for other reasons. Even in the 1970s, one could encounter echoes of older life-ways in Hanover: the cool basement rooms with dirt floors and shelves filled with jarred vegetables and fruit for winter sustenance; the antique tractors rusting on back lots; the bleached yellow barns that were there first, before the land was developed for housing and the roads expanded for cars; the beautiful brass bands playing Christmas carols, slightly out of tune, on dark December evenings, “O Come, O Come Emmanuel”; the elders’ subtle German accents; the butcher shop down the way; and the fertile land still stretching into the distance, still yielding a rich bounty year after year. For me, a visit to Hanover offered wave after wave of mystical experiences, of heart-beats skipped, of breath-taking beauty, of apprehensions of a simpler, more sustainable life, of pausing, still and quiet, for a few incredible moments in the graveyard where my grandparents had already bought their plots, or sitting in the kitchen in the old house on Frederick Street where my mother and her siblings had grown up; wave after wave of insight into the gifts and blessings of my ancestors, insight into a way of living in harmony with the Earth, respecting the Earth, learning from the Earth; wave after wave of insight into what it means to love and trust a Holy power larger than yourself, to rest in its comforting arms, to praise it for its existence, to thank it for its abundant gifts. But this look—this glorious, deeply spiritual look at what life could be—was a backwards look, a look into a receding world, or so I assumed. It was not human progress onward and upward forever. It was not the future. It looked to my untrained eye like a form of death. Hanover could be so disconcerting. I didn’t recognize it then, but looking back I see, emerging in me, spiritual fragmentation, mirroring a larger fragmentation in the human family. Without any adult having to say it, without any adult even intending it to happen, somehow I felt compelled to choose between my liberal, Humanist faith, and my grandmother’s traditional, Theistic faith; between my modern, suburban post-industrial lifestyle and my grandmother’s rural, earth-based, old world living. Was the choice really necessary? We might say, “Fine! So what?!? That’s what growing up is all about, isn’t it? Figuring these things out, making choices, following a path. And you turned out OK Rev.” This is true, but I also can’t ignore the poet’s truth: “A fracture broke across the rings you’d ripened. / A screaming shattered the voices / that had just come together to speak you, to make of you a bridge / over the chasm of everything. / And what they have stammered ever since / are fragments / of your ancient name.” Yes, perhaps growing up requires that we make spiritual choices and box ourselves into certain life ways; but every time we do this we risk growing spiritually fragmented. And for many of us—for many Unitarian Universalists and liberal religious people—the whole idea of God ceases to have any meaning, because the God we typically encounter—often when some well-meaning person tries to convince of God’s reality (sometimes gently, sometimes not so gently)—is a broken God—a judgmental, angry, damning God. They are only stammering a fragment of the ancient name. What utter fools we humans have been, ripping the Holy apart like this, creating a culture that compels us to choose one piece. What utter fools we’ve been, tearing God into shreds, and then wrapping ourselves in only one shred, or none, growing self-righteous, judging, not recognizing the paucity of our spiritual garment, not recognizing our own shivering in the gathering cold. I don’t pretend to speak with authority on what a whole God is, but I am convinced human beings have only been able to visit atrocities and injustices, terrorism and wars upon other human beings because we first ripped God apart. I am convinced human beings now confront unprecedented and catastrophic environmental change because we first ripped God apart. I am convinced that our capacity to judge and condemn, alienate and isolate, bomb and torture, exploit and enslave, pollute and plunder, is rooted in our tearing God asunder. When we look out at the world and bear witness to brokenness in the human family and brokenness in the human spirit it is because, after millennia of human existence, we still only stammer fragments of God’s ancient name. Hanover never should have been a disconcerting experience for a child. Hanover should have been (and I’m thankful it is now) a moment to recognize that the spirit and energy present in humanity, in human innovation, in science, in reason, in our aspirations towards progress—curing disease, advancing technology, eliminating poverty, expanding freedom—is connected to the God who has journeyed as a comforting presence with countless human beings into slavery, into concentration camps, into genocides, into trails of tears, into occupation, into war, into violence; which itself is connected to the God who carried my grandparents through all their times of hardship and struggle, to whom they prayed whether the land was barren or fertile and in whom they placed their trust; which is itself connected to the Holy Spirit who rode on lush harmonies of brass band Christmas carols, slightly out of tune, on dark, December evenings; which is itself connected to the energy and sustenance stored in jars of vegetables and fruits on cool basement shelves, ready for the long winter months; which is itself connected to ghosts haunting old yellow barns and rusting tractors and to the voices of the ancestors speaking of a more simple and sustainable life; which is connected to Nature, the Earth, the land, the soil that, if respected and treated well by all of us—as the ancients knew—will continue to yield abundance, will continue to sustain life, will continue to enable survival even through the harshest of times; which is itself connected to the Goddess, the Great Mother, the Creative power of the universe; which is itself, in the words of Nancy Shaffer in our second reading this morning, “Peace … / One My Mother knew … / Ancestor … / Wind. / Rain. / Breath …. / Refuge. / That Which Holds All. / … Water. / … Kuan Yin. / … Womb. / Witness. / Great Kindness. / Great Eagle. / Eternal Stillness; which is itself connected to the God who cries out for atonement for human atrocities; which is itself connected to the God who is clearly powerless to stop human beings from killing each other, yet who offers to us, over and over, through the prophetic urgings of seers and sages and holy people throughout the ages the path of love thy neighbor as thyself; which is itself connected to all the powers and experiences and love that saves us in this life, in a multitude of ways, again and again, if we would only wake up, if we would only notice, if we would only weave back together the tattered shreds, if we would only let God be whole. God’s ancient name must be some version of the word whole. The midwinter season beckons us toward this wholeness. It’s there in the mixing of the sacred and secular—the nativity scene in the middle of the shopping mall. It’s there in the mixing of the pagan and Christian symbols: the evergreen, that ancient symbol of life prevailing through the winter, decorated with the angels and stars of Luke’s gospel. It’s there in the story of a miraculous birth—the common story of so many gods and goddesses and heroes throughout human history. And it’s there in the message which we associate with Christmas but which resides at the core of so many faith traditions: peace on Earth, goodwill to all. So many fragments come together in this season, pointing us towards a deeper meaning for our lives, calling us to the work of healing the human family and healing the collective human spirit, calling out God’s ancient name, not a fragment; and beckoning us toward wholeness. Rilke, Rainer Maria, “I Read it Hear in Your Very Word,” in Barrows, Anita and Macy, Joanna, translators, Rilke’s Book of Hours: Love Poems to God (New York: Riverhead Books, 1996) p. 55. Shaffer, Nancy, “That Which Holds All,” Instructions in Joy (Boston: Skinner House Books, 2002) p. 23.